We've heard enough near-death experiences to know that there's something on the "other side." Maybe there's more than just white light. We can take a cue from those folks who are not dead yet, but who are in terminally in bed, close to death. What do they see? What do they dream about? Do their visions of the afterlife make any sense? Do we need to listen to their experiences? Can we be better friends to the dying? All of this and more comes out for discussion in the new book, Words at the Threshold. We can be grateful to the author, Lisa Smartt, for taking the time to be with so many folks who were close to crossing over. Think of the number of hospices she visited, and all the folks she talked to. Many readers will find themselves, like me, fascinated by the accounts of death bed visions of family members waiting on the other side. The suggestions about the afterlife that these stories provide are really something. We also get a better picture of what it is like to be nearing death. It's not one of our favorite subjects, but more and more, it is coming into our awareness. To explore Words at the Threshold at Amazon.com, click here! What is the Final Words Project? 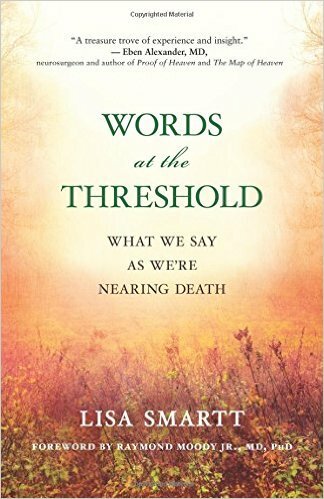 I established the Final Words Project in 2014 to better understand the communications of the dying, since no other linguist had systematically studied people’s final words. My hope was that through collecting final words and analyzing the language, I might be able to shed light on what happens to consciousness as we die. I also hoped the research would help others connect more meaningfully with their beloveds at end of life. How did you get into studying last words of the dying. I studied linguistics at UC Berkeley and was trained to seek patterns in language, no matter how unintelligible the language is. So as my father was dying, and I noticed fascinating shifts in his language, I wrote down what he said and began to watch in wonder as patterns emerged. What about your Dad’s last words was so fascinating? My father was a vocal skeptic, so I was stunned when he described seeing angels as he was dying. One day he announced, “Enough…the angels say enough…only three days left.” Indeed, three days later he died. I noticed that he began to speak in highly metaphoric and nonsensical language, with unusual use of prepositions, saying things like, “I am crossing up. Help me get down from here,” and frequent non-referential language such as, “This is very interesting. I have never done this before.” My questions about my father’s final words led me to wonder if what I witnessed occurred in the language of others at the end of life, so I established the Final Words Project to find out. You created the Final Words Project with Raymond Moody, who coined the term near-death experience in his bestselling book Life After Life. How did your partnership come to be? Soon after my father died, a friend told me about a course he was co-teaching with Raymond Moody. I was intrigued, so I decided to attend. At the workshop, Raymond discussed his decades-long research into unintelligible speech, and I knew I had to study with him. I retired early from my position as a literacy specialist and headed out to Georgia to learn from him and begin a four-year odyssey into final words. How did you collect the data for your research? I gathered accounts from family members and friends of the dying and healthcare providers across the United States and Canada through the Final Words Project website, Facebook page and through interviews. Are the people you studied primarily older in age or in hospice? Or do they range from young to old, across cultures? The majority of accounts came from the terminally ill in hospice from children to seniors. The research so far has been limited to English speakers across Canada and the United States. The last words of the dying are sometimes disregarded as nonsense or the result of delirium or medication. But, is there something else going on? Yes, medications and delirium do, of course, affect language. However, interestingly enough there are certain patterns of nonsense that seem to occur no matter what kind of medication or illnesses. In my data, there are clear patterns of both situational and linguistic nonsense. In situational nonsense, the words themselves make understandable sentences, but they do not make sense in the given context. For example, people who are bed ridden or unable to move physically, may say things like, “Help me get down from here” or “Let me go backwards now, so I can go forward again,” or they may talk about taking a trip or awaiting a big event. People may utter hybrid nonsense, when they speak of things that the living see and things that we don't such as “Get me a pencil and paper,” referring to a real-life pencil and paper, and then say, “I need to write down the names of everyone coming to the big party tonight.” Only there is no real party and the attendees the person writes down are all deceased. The person appears to be aware of both the world we know and the one that is unseen. We may hear nonsensical descriptions of places or people, “Look at all the pretty flowers here!” or “See the forest!” or they may say, “There are so many people in here… it's so crowded. I don't have time to talk to all these people.” We hear more paradoxical language “No, but if you don’t and you do, then you do,” or something like “Grant me half a full measure of it.” You also hear nonsense that is linguistic nonsense, in which the language itself makes no sense like, “Anything I should do to accumulate what I am into?” Until now, the nonsensical language of end of life has been completely discounted, and I am suggesting that we begin to analyze and understand the patterns with the same diligence that we have studied the nonsense of infancy and childhood. You analyzed over 1,500 end-of-life phrases – what trends and patterns have you discovered? There is a trend away from literal, three dimensional, five sense language such as, “The table is made of wood” to more metaphoric and symbolic language such as, “I need my passport,” when there is no actual trip planned to language that seems completely unintelligible such as, “Oh, sir, get the doll a roofing.” Some people also describe a kind of telepathic communication with their patients or loved ones at the end of life. There is a continuum of language that spans literal, figurative, nonsensical, nonverbal, and even telepathic communication. What are common themes or metaphors that appear in end-of-life speech? As people approach death, they often announce the coming of an important event such as the big dance, dinner, art show, poker game. For example, a golfer may announce the big golf game and that his deceased buddies are waiting for him to make a foursome. We also hear metaphors of an upcoming trip and transportation: “Yellow bus! There’s the bus.” Or, “I will need my oxygen tank for the long trip to Las Vegas.” People who love sailing or cruises may speak about ships or boats awaiting them. Linguist George Lakoff has identified that one of the central metaphors we use in American English is the mind or body is a machine, so it is not surprising then that a common metaphor that emerges in the data refers to things breaking down. “I need maintenance for this.” “Everything in pieces… so many pieces…” “I got to put this all back together.” “I need to put things in order.” There are also a lot of references to shapes, particularly circles and boxes. Can you give us a few examples of “famous last words” that were uttered by well-known individuals / celebrities? What are the most fascinating things you discovered through your research? Terminal lucidity: This little researched phenomena occurs days before people die in which there is a sudden burst of energy and clarity of thought right before dying during which people often express words of wonder, love, guidance or reconciliation. One mother emerged from a coma a day before dying to say, “Tell everyone that I love them and that I am okay!” In the most dramatic account submitted, a mother with Alzheimers arose from a coma to tell her son where all the financial files were kept in the study after having not spoken lucidly in years. She died a few days later. Conversations with deceased loved ones other figures are very intriguing, and recently this phenomenon has been well documented by academic researchers. It is estimated that between 70 to 80 % of people see and often audibly communicate with a deceased friend or family member right before dying. Sustained narrative: These are metaphors or visions that evolve and are sustained over several days, even weeks of the dying process. For example, “I need my map,” will change to “Who has got my suitcase? I need my suitcase,” to “My suitcase is packed. I am ready to go now.” I find it amazing that as we are dying, and one would imagine that our cognitive capacity is degraded, people develop and track a metaphor or narrative over a period of days and weeks. Could you remember something you said five days ago and then develop it over time without writing it down? In your opinion, what does end-of-life speech say about consciousness? Sustained narratives, for example, indicate to me that there is some form of consciousness that is tracking what we are saying even as our bodies and brains are dying. How is that possible? How do we track an evolving metaphor? As we die, many of us move into increasing states of wordlessness, and these states are often associated with an increase in visions of deceased beloveds, conversations with people who died before us, descriptions of landscapes, of boats, trains, and other forms of transportation that are not seen in the “real world.” We may also see people emerge from unresponsive states as in the case of terminal lucidity to offer forgiveness, love or guidance. As our bodies and brains are degenerating, we see highly complex language capabilities and descriptions, including phenonema like sustained narrative or conversations with deceased relatives and friends or descriptions of unusual landscapes or a sentence such as, "What is this doorway we are crossing over into?" What does “nonsense talk” of the dying reveal about life after death? First of all, the fact that we see patterns at all in the nonsense indicates to me that there may indeed be a greater organization to unintelligible language than we have ever imagined. It is intriguing to me that as our brains diminish in capacity that such language and experiences emerge. How does one explain terminal lucidity, complex metaphors, conversations with the deceased, paradoxical language, sustained narratives and more, without at least considering the possibility that there is consciousness that lives outside of our physical brains? What do you mean when you say children and the dying seem to share a common language? Children seem to be more deeply attuned to the unseen world as well as the nonsensical and nonverbal communication of the dying. This story is typical: “Soon after Joanne’s passing, my daughter pointed to the bedroom ceiling and said, ‘Mommy, look! Look at all the birds!’ The next night, my daughter slept with me; and then in the middle of the night, there was a big thud as she fell onto the floor. This was very unusual and woke me up with a start. I asked her what happened. She told me, ‘I saw JiJo on a ladder going up — and she was on the top...and I wanted to go with her, but she said, ‘No, no, honey you have to go back down!’” Another person described a moment when his two year old niece sat on the bed with his dying grandmother. “They were face to face, eye to eye, and both spoke babbling nonsense. I remember watching in awe as they spoke with these waves of sounds — and they both seemed to understand.” Research by Leigh and Metzker indicate that children and parents may have a kind telepathic connection before children start speaking, and I believe that we may perhaps return to this kind of communication as we die. This idea is based on my interviews with people who have had near-death experiences and accounts from friends and family members as well as caregivers of the dying. What tips do have to offer for loved ones or healthcare providers on how to respond to the speech of the dying? Enter the world of the person dying. Keeping a final-words journal can help you do this. Have eyes for the sacred. Be open to the possibility that something transpersonal is occurring, and that the words you hear are tracking its course. Assume your loved one hears you even when unresponsive. As we die, our sense of hearing is the last sense to go. When you are in another room, and especially when you are speaking about your beloved, speak with lots of praise and gratitude. Savor silence. Sometimes it is better to just sit with your loved one. Know that the dying may be much more attuned to telepathic or other nonverbal communication, much like the kind of communication we experience in meditation or prayer.